Bridesmaid Dresses ? Is Un-matching the New Trend?? 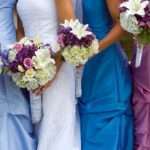 If you have attended a wedding recently, chances are you noticed the popular trend among?bridesmaids. More now than ever, bridesmaids are wearing dresses in different styles or colors and more brides are starting to choose this option for their attendants.? There are several reasons why this new trend is catching on. First of all, if bridesmaids are given the option to choose their own gown, chances are they?ll love it and be able to wear it again in the future. Many of us still have several bridesmaid dresses hanging in our closets from past weddings. Second, it’s ?difficult for a bride to choose one dress style that will look good on several different ?ladies with varying shapes. ?Third, and most important, it?s one less decision for the bride to make during what ends up a very stressful time. Typically, brides will choose a color theme or style and send their attendants out to search for a dress on their own. Finally, if bridesmaids are to pay for their own dresses, the bride can feel better about the expense their honored attendees will be purchasing for their wedding day. For the easiest solution for un-matching bridesmaid dresses, shop through a bridal company where you will find the best selection. ?The bride can choose the fabric and color, then the bridesmaids can simply choose their favorite style.? Overall, the trend for un-matching bridesmaid dresses can be a positive experience for everyone involved.